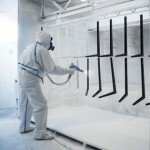 Powder coating is a process of applying a layer of dry powder to a surface electrostatically, then curing the material with heat to form a solid coating. Worker inhalation and exposure to powder coating materials must be avoided, and the powder can present a significant risk of combustion. Air Purification Inc. offers cartridge collectors that are ducted to a powder coating batch mixer equipped with a moveable, crescent shaped hood, successfully capturing powders and providing clean, safe, breathable air. Count on Air Purification to help keep production running and to keep your workers safe.